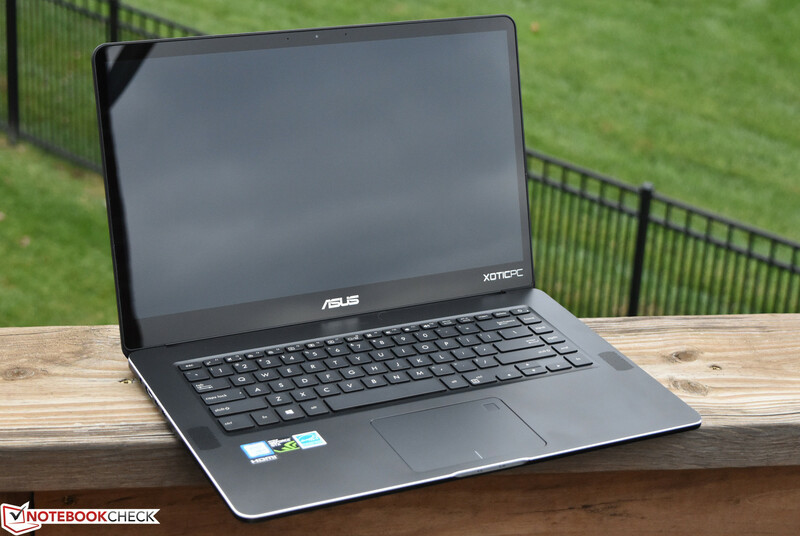 Visually, the UX580 is nothing more than a UX550 with a secondary trackpad display. Users not interested in the dual-screen capabilities of the UX580 can now get the UX550 with an Intel 8th gen Core i7 processor for $1800 USD. After revealing the ZenBook Pro 15 UX580 and its dual-screen features at Computex 2018, many were left wondering if it would spell the end of the more down-to-Earth UX550 series. The UX550 launched last year with Core i7-7700HQ and GTX 1050 or 1050 Ti options, but the series has been in the back-burner while Asus focused its marketing efforts on the more novel UX580 instead. Now that the UX580 has been available for over a month, the manufacturer is finally ready to start shipping an updated version of the UX550. The press release below details the new UX550GE with a Core i7-8750H CPU whereas last year's model carried quad-core Kaby Lake options only. Everything else about the notebook remains unchanged including the 15.6-inch 4K UHD touchscreen, GTX 1050 Ti GPU, and narrow-bezel NanoEdge design. Thus, this is simply an internal CPU update to bring the UX550 more in line with competitors like the Dell XPS 15 9570 and MacBook Pro 15 2018 in terms of raw CPU horsepower. We recommend checking out our existing reviews on the UX550VE and UX550VD for more information on the series. Between our last two UX550 test units, however, we experienced some fan rattling and electronic noise that we hope the new UX550GE will address. The ZenBook Pro 15 UX550GE will begin shipping on August 17th for $1800 USD. Fremont, CA (August 6, 2018) — ASUS today announced the availability of the new ZenBook Pro 15, a professional-grade 15.6-inch laptop comprised of only the highest performance parts. The best-ever screen on a ZenBook Pro is now a 4k (UHD) touchscreen, is PANTONE® Validated, comes with guaranteed color accuracy out of the box, and is framed with thin bezels. The latest generation Intel® Core™ i7 provides 6-cores and 12-threads of computational power, and the NVIDIA® GeForce® GTX 1050 Ti not only GPU-accelerates editing, modeling, and other workloads but also delivers high-quality Full HD gaming. The ZenBook Pro 15 has an incredible amount of power housed in an elegant all-aluminum build and is equipped with both Thunderbolt™ 3 ports and an integrated fingerprint sensor. The ZenBook Pro 15 is built to deliver the ultimate on-the-go performance. At its heart is the incredibly powerful 8th Generation Intel Core i7-8750H hexa-core processor. This amazing processor is backed with up to 16GB of high-performance 2400MHz DDR4 RAM and a blisteringly fast up to 1TB PCIe 3.0 x4 SSD. The ZenBook Pro 15 uses an NVIDIA GeForce GTX 1050 Ti with 4GB of GDDR5 video memory to deliver the horsepower needed for GPU-intensive tasks such as transcoding, rendering,4K video playback and machine learning, while also being capable of robust Full HD gaming performance. Creators, developers and gamers will enjoy the best possible performance with the new ZenBook Pro 15. With an astonishing resolution of up to 3840 x 2160 pixels — 4X more than Full HD — the 4K UHD NanoEdge display on the ASUS ZenBook Pro 15 is a sight to behold. The pixel density of 282ppi ensures that everything is pin-sharp, from the finest details in photos and videos to the tiniest text. The wide 100% Adobe RGB and 132% sRGB color gamut combined with a Delta-E color difference of less than 2.0 give the PANTONE Validated display incredibly accurate and natural-looking colors. Its 178° wide-view technology allows users to enjoy a perfect picture even at acute viewing angles. The ZenBook Pro 15 also delivers an amazing audio performance through its Harman Kardon-certified ASUS SonicMaster sound system, which features high-quality speakers powered by a smart amplifier for sound that's 1.4X louder than the previous generation of ZenBook Pro. It also delivers a 1.6X-wider frequency response, ensuring rich, crystal-clear full-range sound even at high volume levels. The elegant finish and refined profile of the ZenBook Pro 15 belies the power inside. Its precision-crafted, solid-aluminum unibody features the iconic Zen-inspired spun-metal finish on the lid, and comes in a brand-new luxurious Deep Dive Blue color scheme with contrasting Rose Gold diamond-cut edges. Featuring a 15.6-inch NanoEdge display with an ultrathin 7.3mm bezel that gives it an incredible 83% screen-to-body ratio, the ZenBook Pro 15 is remarkably compact for such a high-performance laptop, with dimensions comparable to some 14-inch laptops. And at just 18.9mm thin with a travel-friendly weight of only 4.2 lbs., the ZenBook Pro 15 is a gorgeous powerhouse that can be taken anywhere and everywhere. With faster-than-wired speeds of up to 1734Mbps — up to 12X faster than 802.11n — the dual-band 802.11ac Wi-Fi in the ZenBook Pro 15 has greater range and establishes more stable network connections for smooth streaming of 4K UHD online videos and more.The two USB-C ports on the ZenBook Pro 15 incorporate the latest Thunderbolt 3 technology for versatile, ultrafast connections. Along with up to 40Gbps data transfer speeds — up to 2X faster than Thunderbolt 2 and 8X faster than USB 3.1 Gen 1 — Thunderbolt 3 supports power delivery and dual 4K UHD external displays, making ZenBook Pro 15 a superb choice for graphics professionals. There are also two USB 3.1 Gen 2 Type-A ports and an HDMI port for the ultimate, hassle-free connectivity. An integrated fingerprint sensor in the touchpad allows fast and secure password-free login with just a single touch via Windows Hello. 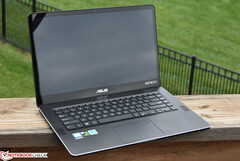 The ASUS ZenBook Pro 15 UX550GE-XB71T is immediately available at a MSRP of $1,799 USD from the ASUS Store,Adorama, Amazon, B&H, HID Evolution, ExcaliberPC, and Newegg.